Very nice clock for the price and no need to wind it. I bought this as a Christmas gift for my wife and she loves it. 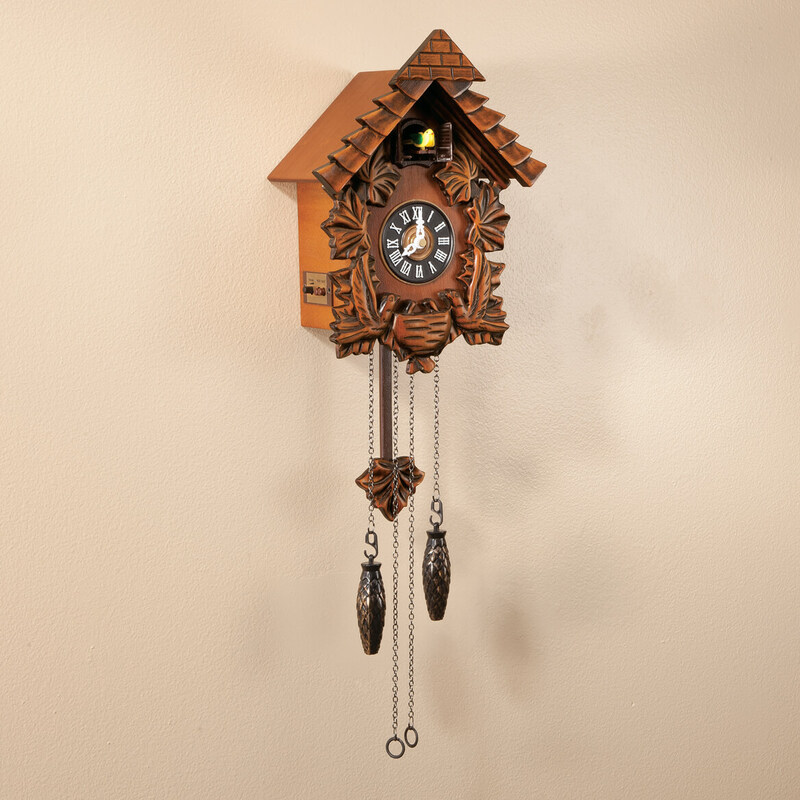 Our old cuckoo clock required us to rewind it everyday, but this one is battery operated and just keeps on running. We are very happy with this purchase . It is 100% as advertised. Very detailed and keeps perfect time. Easy to set up so bird cuckoos right number of times on the hour and easy to adjust volume with controls on side of clock. Volume can be turned off at night if needed. Pleasant cuckoo sound and ticking of pendulum. We enjoy this clock very much. I am so glad I purchased it. 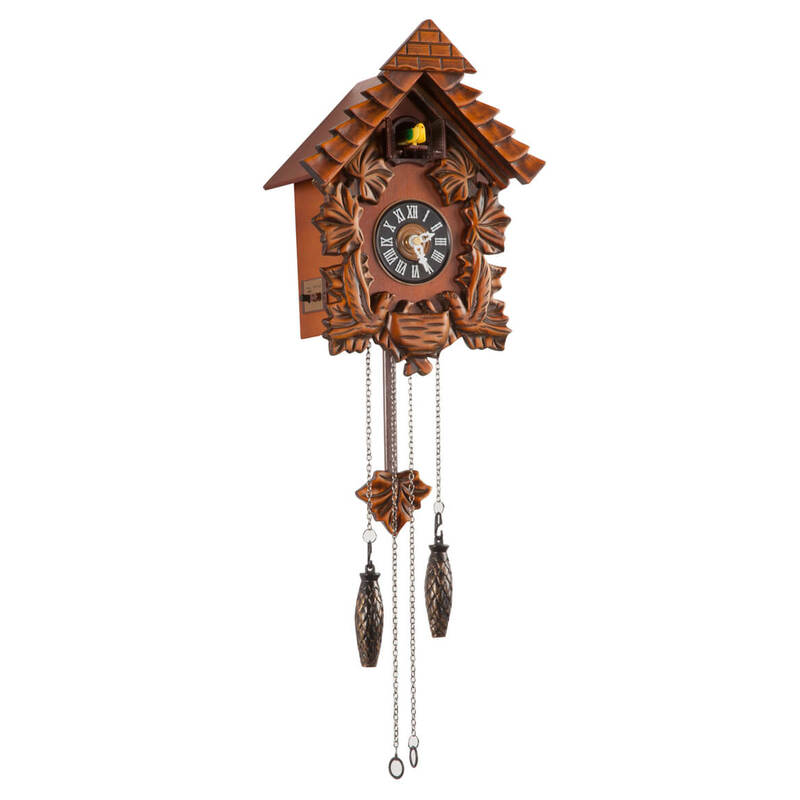 Love love love this cuckoo clock. Really nice!!! Very impressed with the quality!! Always wanted one but cant afford a hand made from Germany like my Grand mom had. This clock is very handsome to look at and affordable. I'm very pleased and glad I bought it. I love Cuckoo Clocks. They add charm to any home and this one is small for my small space. What kind of wood is this clock made of? BEST ANSWER: Thank you for your question. This is made of 90% plywood and 10% linden. We hope this information will be of help to you. does the pendulum move at all to the time, or does it just sit there as a decoration? BEST ANSWER: Yes it does. The pendulum swings back and forth plus the cuckoo counts the hour. I was a little afraid at first that it would only chirp once at the top of the hour but it does count the hour like a traditional clock. Very attractive clock for the price. Thank you for your question. Yes the pendulum does move. We hope this information will be of help to you. thank you. i received it yesterday and it does move. I love this clock, I was wondering, starting at 10pm it does not cuckoo on the hour, but starts agin in the AM, this is a very nice feature, but I don’t know if it should do that? BEST ANSWER: The clock has a night time shut off switch from 10pm till morning located on the side of the clock. Your clock may have been shipped with this feature set to on. Simply turn the switch to the off position and your clock should cuckoo on each hour. Where is the clock made? BEST ANSWER: Thank you for your question. The clock is made in China. We hope this information will be of help to you. Does the cuckoo clock play music? BEST ANSWER: Thank you for your question. As the classic yellow bird pops out at the top of every hour, you’ll hear a soft cuckoo sound effect along with background nature sounds! We hope this information will be of help to you.